Treaty 8 First Nations Cup hockey tournament Women’s Division champions: Driftpile Spirit. In the front row left-right, are Kali Cunningham, Angel Chalifoux, Lashay Van de Ligt, Sara Neufeld, Kassie Hamelin, Madison Cardinal and Elisha Cunningham. In the back row, left-right, are coach Jonathan Giroux, Shonda Desjarlais, Amanda Courtorielle, Tristan Haggerty, Rianna Horseman and Kyra Giroux. 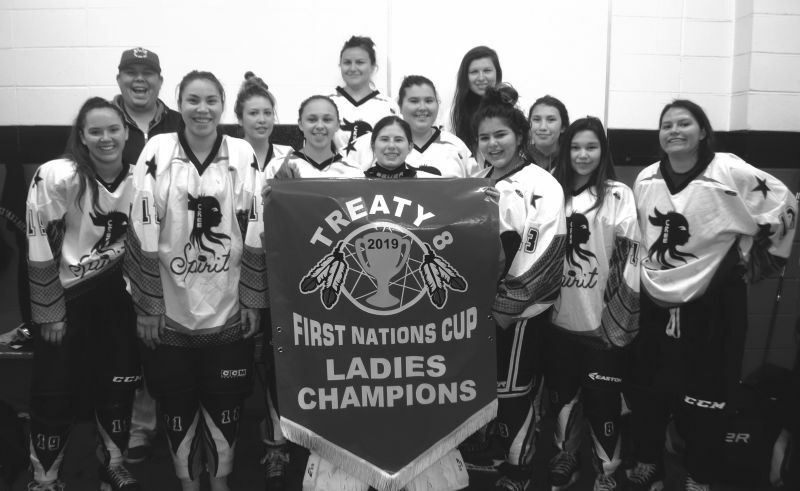 Two local hockey teams captured division championships in the 17th annual Treaty 8 First Nations Cup in High Prairie, March 28-31. Whitefish Lake Hawks won the Men’s Division title after they defeated Bigstone Cree Nation, of Wabasca, 5-4 in the final. Bigstone Cree Nation captured the Legends Division after defeating the Sturgeon Lake Blues 4-3 in the final. Driftpile First Nation defeated Sturgeon Lake Chill 4-3 to win the Women’s Division banner. “Again we had very strong competition, with lots of one-goal games, overtimes and shootouts,” says Dwayne Thunder, co-ordinator and co-founder of the tournament. A total of 33 teams competed, with 20 in the Men’s Division, seven in the Legends Division and six in the Women’s Division. Games were played in High Prairie at the Sports Palace and Gordon Buchanan Recreation Centre. From the original teams from Sucker Creek, Whitefish Lake, Woodland Cree, Sturgeon Lake and Loon River, Thunder says this year’s tournament also included teams from Driftpile, Grouard, Bigstone, Tallcree, Little Red River, Horse Lake, Swan River, Peerless/Trout, Garden River, Little Buffalo, Fort MacKay and Chipewyan Prairie. 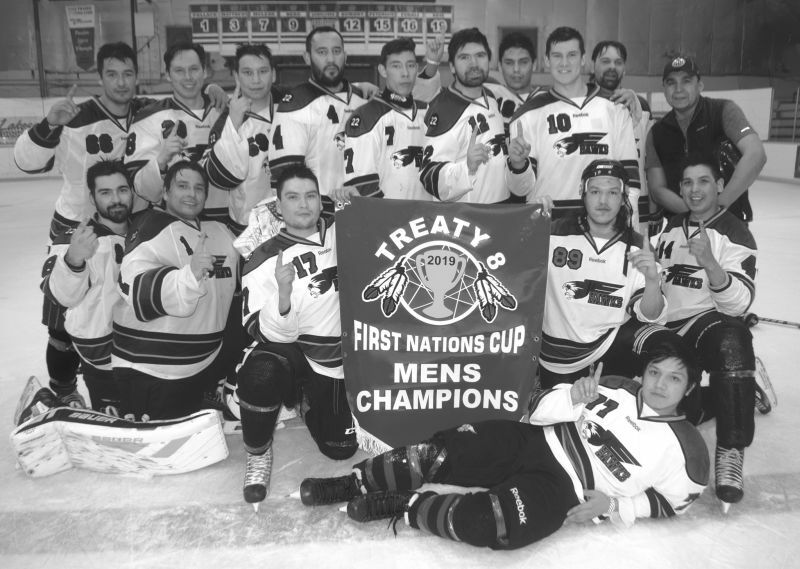 Treaty 8 First Nations Cup hockey tournament Men’s Division champions: the Whitefish Lake Hawks. Laying in front is Kyle Gladue. In the front row, left-right, are Kayne Jagodzinsky, Sanford Lamouche, Lenny L’Hirondelle, Jacob Anderson and Everette Nahachick. In the back row, left-right, are Allan Anderson Jr., Gordon Laderoute, Chad Anderson, Eli Cunningham, Seattle Cunningham, Tyrel Laderoute, Nelson Anderson, Ira Gladue, Craig Van de Ligt and coach Richard Laboucan. 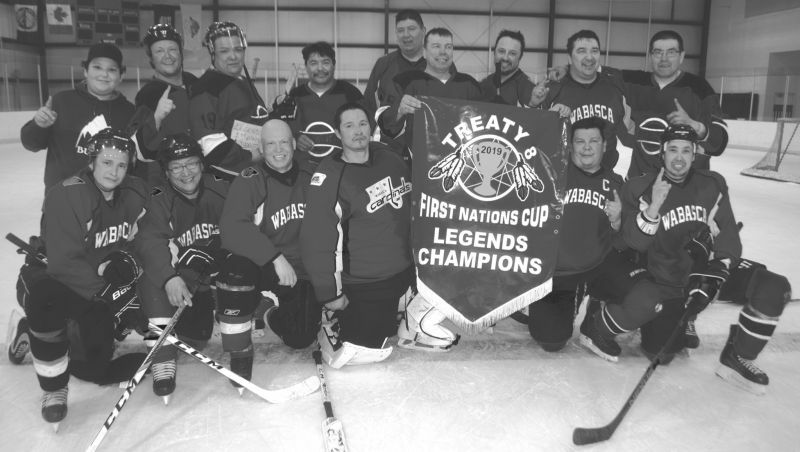 Treaty 8 First Nations Cup hockey tournament Legends Division champions: Bigstone Cree Nation, of Wabasca. In the front row, left-right, are Bernie Sinclair, Manny Cardinal, Marcel Auger, Aaron Cardinal, Francis Alook and Johnny Alook. In the back row, left-right, are stick boy Mathew Gullion, Dale Gullion, Lyle Cardinal, Alvin Oar, Patrick Lirondelle, Leon Bigstone, Chris Yellowknee, Daryl Auger and Morin Yellowknee.